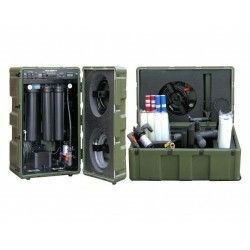 List of products by manufacturer Aspen Water, Inc.
Aspen Water Inc, is a Mechanical or Industrial Engineering company located in Texas, United States specialising in portable, versatile water purification systems for military, emergency response and humanitarian relief, military water purification, mobile water purification. The ASPEN 5500M water purification system will supply 18.000 liters per day (around 750 liters per hour) of highly purified water from virtually any non-saline water source. Water can be drawn from ditches, rivers, lakes or standing water that may contain chemical and/or biological contamination. 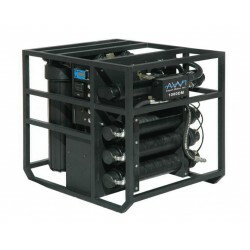 The ASPEN 3300M water purifier supplies 10.000 to 12.000 liter per day (about 500 liter per hour) of highly purified water from virtually any non-saline water source. Water can be drawn from ditches, ponds, rivers, lakes or standing water that may contain chemical and/or biological contamination. 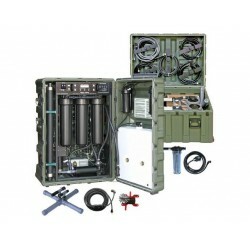 The Aspen 2000DM water filtration unit is the most compact, versatile, full featured, computer controlled, energy efficient, mobile reverse osmosis system available today. 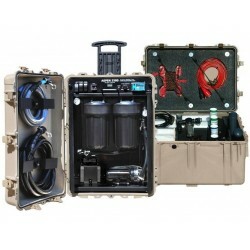 All internal mechanical systems are mounted on a strong lightweight aluminum frame enclosed in a ruggedized military style case. The ASPEN 1000DM Reverse Osmosis water purification system will supply up to 3700 liters per day (just under 3.8 liter per minute) of highly purified water from virtually any water source including seawater!